In this image made from a Nov. 3, 2018, video, F-18 fighter jets are anchored on the deck of the USS Ronald Reagan during maneuvers in the waters off Iwakuni, Japan. On Nov. 12, while on routine operations in the Philippine Sea, an F-18 from the USS Reagan crashed into the sea but its two aviators were rescued safely. Five U.S. Marines were missing and two people were rescued after two aircraft were involved in an accident off the coast of Japan early Thursday, the Marine Corps said. In a statement from the Marine base in Okinawa, officials said that two Marine aircraft, a KC-130 Hercules and an F/A-18 Hornet, were involved in the accident about 200 miles off the coast of Japan, around 2 a.m. The aircraft had taken off from a base at Iwakuni, in southern Japan, and were “conducting regularly scheduled training when the mishap occurred,” the statement said. It provided few details about what had occurred, saying only that the circumstances were under investigation. The rescued person was evaluated by medical personnel, the statement said, and Japanese aircraft had joined the search for the six Marines who remained missing. The Marines have not said if the KC-130, a turboprop airplane capable of aerial refueling, was refueling the F/A-18 Hornet, a combat jet, when the accident took place. The accident comes after a series of accidents for the U.S. military in Asia. Last year, a total of 17 sailors were killed in a collision between a Navy destroyer and a container ship off the coast of Japan and, just two months later, a collision between another Navy destroyer and an oil tanker near Singapore. The Navy determined that those deadly collisions were the result of missed warnings and basic errors that could have been avoided. 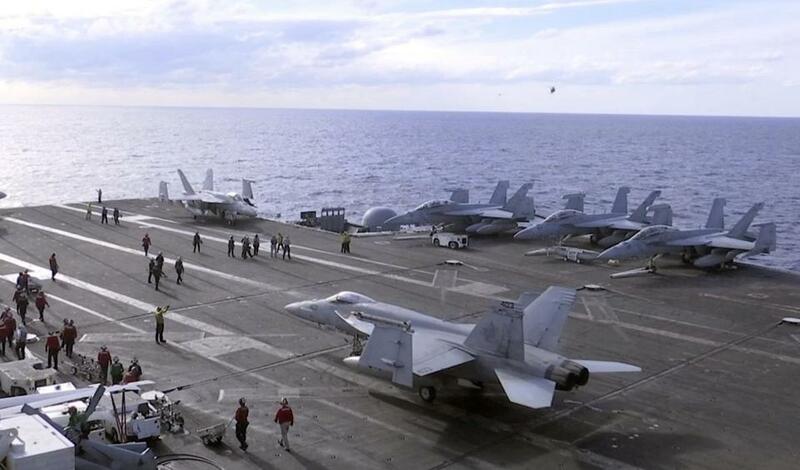 Two aircraft assigned to the carrier USS Ronald Reagan also crashed this fall. And in November, two aviators were rescued northeast of the Philippines after a Navy F/A-18 Super Hornet with a mechanical problem crashed into the Western Pacific. That followed a crash by an MH-60 Seahawk helicopter on the deck of the Ronald Reagan in October that injured 12 sailors.